The Ecopod is a revolutionary and beautifully designed coffin. It brings together artisan skills with style, elegance and a respect for the environment. Made by hand from recycled newspapers, it is hand finished with paper made from 100% mulberry pulp. The Ecopod is available in a range of colours with screen printed motifs, plain white, or gold. 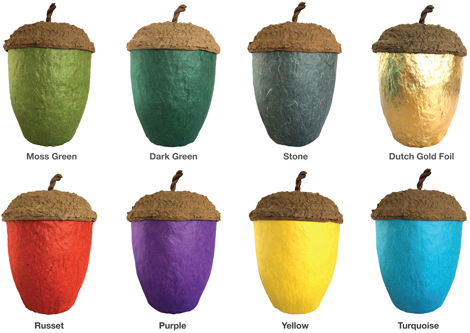 5 New Colours in Acorn Urn Range! We are exploring a number of new manufacturing possibilities, including a ‘hand made’ operation in North America with the Natural Burial Company. Click here – to e-mail your details, join our mailing list and be kept up to date. ARKA Acorn Urn is available for the storage of ashes after cremation and is made from recycled paper. Fully biodegradable and now available in a eight colours. Follow the links for more information.